Versions of the game as a parlor game go back at least as far as 1970, although Balderdash itself was not published until 1984. 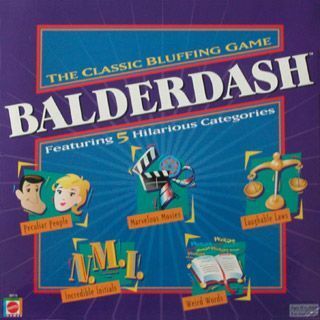 Mattel republished Balderdash in 2006 in a form that derives its gameplay from the sequel Beyond Balderdash. In a peculiar situation, this game was reimplemented by Beyond/Absolute Balderdash and then combined back into the original title (Balderdash) but with the rules and cards from Beyond/Absolute; while Tactic re-published their version of Beyond/Absolute combined with the original Balderdash and called it Kokkelimonke Jubileum.